SHOOTING THE SHIZNIT : Tank Wins Ric Flair Card!! 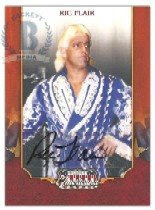 As many of you know, Beckett Media recently gave away 15 copies of the first certified autographed card of “The Nature Boy” Ric Flair, a Donruss Americana promo card from Panini. “I would like to say thank you for letting my husband be one of the 15 winners of the Ric Flair trading cards. Ric Flair was and always will be my husband’s favorite wrestler of all time. I’m sorry for having to tell you this, but my husband passed away on Friday, May 15. Robertson didn’t mention his profession, one that probably did leave a few bumps and bruises as it always does. He also didn’t mention who he had met working independents — guys you might have seen on television like Jerry “The King” Lawler, Rikishi, Kamala, Percy Pringle and “Handsome” Jimmy Valiant among others. But it’s obvious that wrestling touched him, and obviously his hero Flair did, too — as tears brought on by a trading card should attest — and that means he probably did the same for some fans here and there even if he wasn’t seen on television.